In a previous blog I discussed how important communication channels are in the health industry, and how treatments and our approach to exercise can be defined by the words we choose to use. 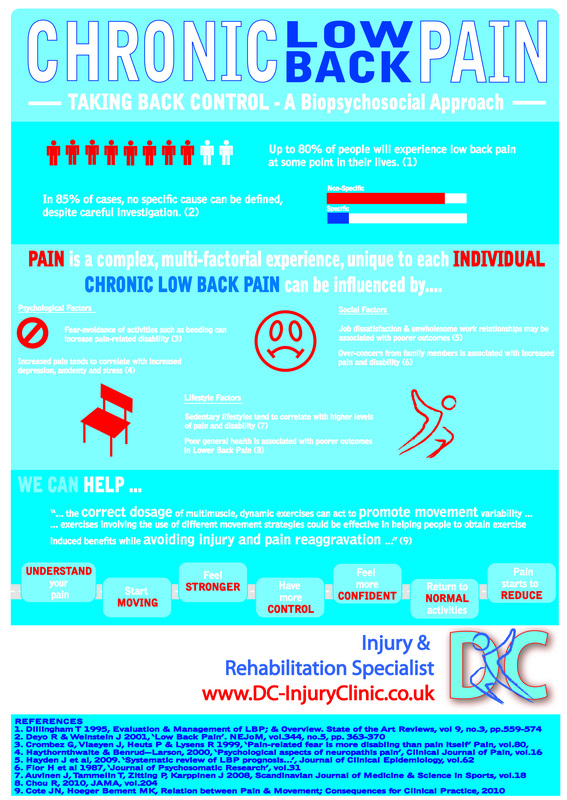 I touched very briefly on the biopsychosocial approach and below is an infographic which explores an introduction to the various criteria to be considered with any chronic pain. If you, or someone you know, is suffering from low back pain, why not get in contact to see how we can help? NB There are no ‘one size fits all’ style quick fixes in most injury scenarios, so these article shouldn’t be seen as such. They are merely guides to a better understanding of how our bodies work. This entry was posted in Uncategorized on 21st September 2015 by DCInjuryClinic.